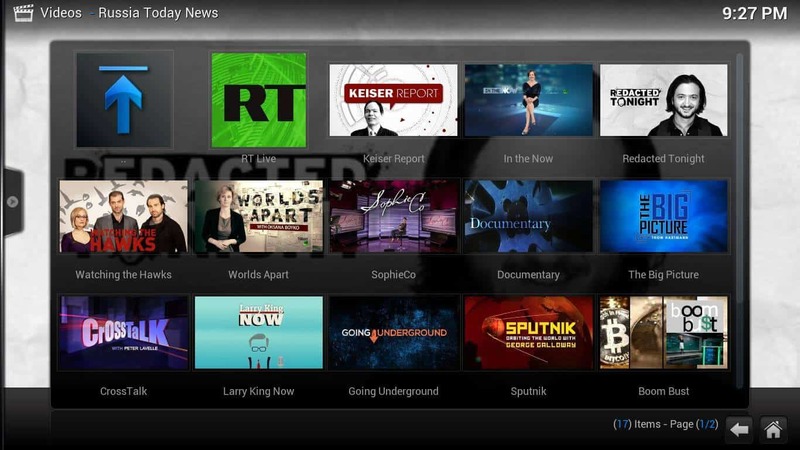 Install Russia Today Kodi addon to get documentaries and live news streams on your HTPC. After you install Russia Today Kodi addon, you will be able to watch several recordings of some of their shows, which are mostly documentaries about economy and politics. You will also be able to watch one of their live streams, which are aimed to people on the US, UK, Spanish-speaking countries, Arabic countries and a stream which only broadcasts documentaries live. There's also a common stream called “RT Global” which is not aimed at any particular audience and instead focuses on more global content. All of their content looks crystal clear and you will experience few hiccups or delays, depending of course on your internet connection speed. This content is mostly in 720p and will play well even in the most inexpensive Android TV boxes. 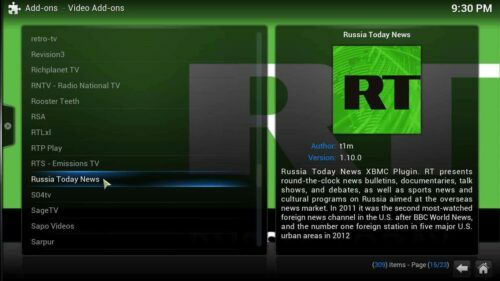 How to install Russia Today Kodi addon? From the Kodi main menu, head to System->Settings->Addons->Get Addons. 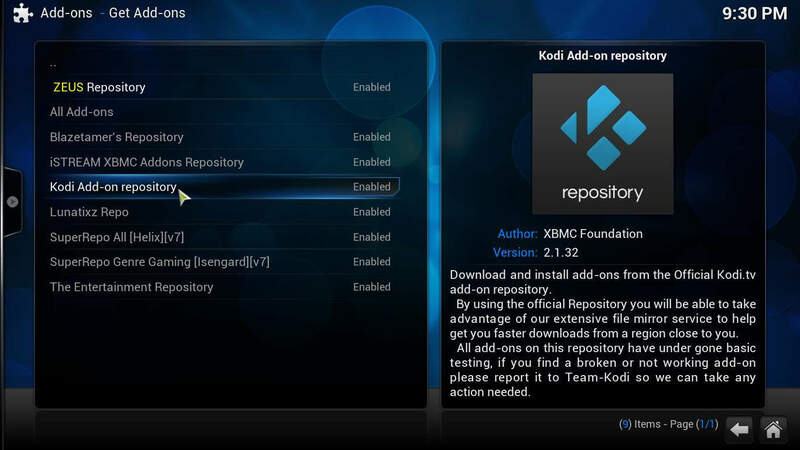 This will give you a list of all the repositories installed on your Kodi setup; however, if you have none installed, there's no problem. Russia Today Kodi addon is available through the default Kodi repository. 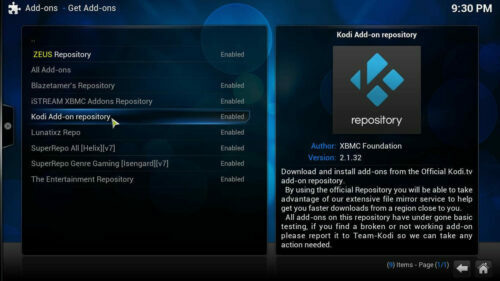 So, select Kodi Add-on repository from the list. You can install Russia Today Kodi addon from the official Kodi addon repository. After you select it, you will be faced with a list of options. Scroll down until you find Video Add-ons, and click there. This will bring up an addon list with all of the addons included in the official repository. However, you will only be interested in how to install Russia Today Kodi addon, so you have to scroll down until you find Russia Today News. Once you find the addon, click on it. 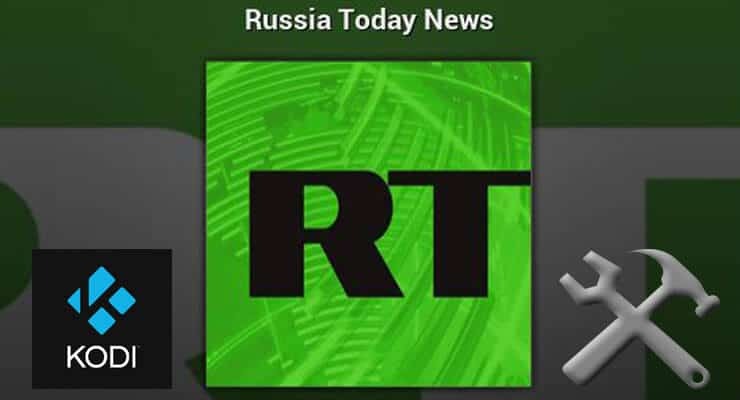 Click on Russia Today News to install Russia Today Kodi addon. This will give you the option to Install, so click again. If you successfully install Russia Today Kodi addon, you will see something like this. After you successfully install Russia Today Kodi addon, you will see this indicator. You're now ready to watch streams with lots of content, from news to documentaries, from the Russia Today network. There are other addons that also bring news for Kodi, and we will be offering you some guides to install them pretty soon. For added comfort, watch your daily dose of global news with a wireless HTPC keyboard on your hand, or at least a mobile with Yatse, the XBMC/Kodi remote; that way, in case you don't like what you see in the news, you can always switch to watch a movie on Genesis Kodi addon, a viral video on 9GAG.TV Kodi addon, or any other content you like.